The Clinton River and nearby Mt. Clemens MI are known widely as "Boat Town USA" because of the huge concentration of marine businesses, services and boats. It rivals anything in California or Florida. There are about 2,000 slips in the immediate area. Much of the area is better suited to powerboats than keel boats due to very skinny water. Powerboat cruisers will find everything they could possibly need in this river mouth. The area extends from the river mouth to the city of Mt. Clemens, MI, about 6.25 nm upstream. The area has long been a center for ship building and a host of marine industries has grown up here over the decades. The first Europeans through here were French fur traders in the mid-1600's and the area remained under French control for over a century. It then passed into British hands before finally being transferred to the United States. Clinton River is home to a number of marinas. 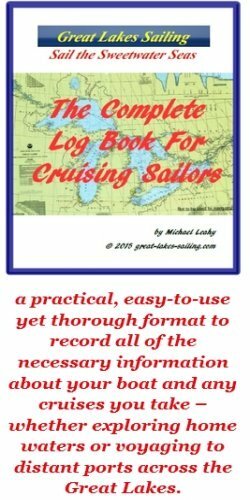 Most cater to powerboats and sailboats cannot advance up the river to Mt. Clemens due to low, fixed bridges. Transient slips can be difficult to find and calling ahead is recommended. There are facilities for sailboats at a yacht club. The approaches to Clinton River are straightforward. The Clinto River extends out into the lake and is easy to see from all directions. The channel begins about .3 nm from the south breakwater and is marked with a Fl RED light ("R2") and a Fl GREEN ("G1") light. Charted depths are shallow so it is better to enter from the channel entrance rather than 'cutting the corner'. The channel is dredged and well marked. There are marinas on both sides of the river. North of the Clinton River lies Belvedere Bay with another large marina complex. There is a marked channel into it, lying on a course of 203.5°T that will bring you right into it. Lands End Marina is located immediately within the mouth of the Clinton River, on the south side. It is a full-service marina with 85 slips. Several are set aside for transients. There is a fuel dock (diesel and gasoline) and a pumpout station. Water and power are available at slips. Their service department can handle repairs and maintence to engines, mechanical & electrical systems and electronics. They carry a full inventory of parts and spares. There are no restrooms or shower facilities. There is a well-stocked ship's store. NSYC is located on the south side of the Clinton River, west of Lands End Marina. They have several slips available for transient sailboats. There is no fuel dock or pumpout station. There is water and power at the slips. Restrooms and showers are available. Sundog Marina lies further up the Clinton River. It has several slips available for transient powerboat sailors. There is no fuel dock or pumpout station. There is water and power available at the docks. There are restrooms and showers. Engine repairs and maintenance to mechanical and electrical systems can be carried out by their service department. Markley Marine lies a bit further up the Clinto River. With 500 slips, it is a big marina. There are at least 3 dozen slips available for transient powerboaters. There is no fuel dock or pumpout station. There is water and power at each slip. They have restrooms, showers and laundry facilities available. Their service department department can carry our repairs and maintenance to engines, mechanical and electrical systems and also do fibreglass repairs. Their extensive grounds are a park-like setting with heated swimming pool, childrens' playground, picnic areas and BBQ grills. Internet service is also available. The town of Mt. Clemens is located about 6.25 nm up the Clinton River. This passage can only be made by powerboats as there is a fixed bridge with a 21'/6.4m clearance over the river. The marina has slips for about 3 dozen vessels. There is no fuel dock or pumpout station. Water and power are available at dockside. There are restrooms available. Being located right downtown, all of the amenities such as shopping and restaurants are readily available. Belvedere Bay lies on the north side of the river entrance. There are two large marinas on this bay. The bay is shallow and it is important to follow the marked channels. Due to charted depths, these marinas are not suitable for keel boats. Belle Maer Marina is entered from the north side. There is a private channel marked with 2 pairs of marker buoys - the outer pair having Fl RED and Fl GREEN lights. A course of 203.5°T will bring you right down the channel to the marina entrance. Belle Maer has 836 slips with about 6 dozen available for transient powerboat cruisers. This is a well-run marina with many services and amenities. There is a fuel dock (diesel and gasoline) and a pumpout station. There are water, power and telephone hookups at each slip. The marina is also home to a number of marine service companies. Whether its canvas work, fibreglass repairs or a wide variety of engine, mechanical and electrical systems repairs, probably anything you need done can be accomplished here. The extensive grounds have a heated swimming pool, childrens' play areas, beaches, picnic areas with BBQ grills and a pavillion. There is also a shuttle service to nearby restaurants. Wireless internet access is available. MacRay Harbor Marina is adjacent to Belle Maer Marina. This is another large, well-run marina with over 500 slips. At least 3 dozen are available for transient cruisets. This resort-style marina is suitable only for powerboats due to shallow water depths on approach. Entry is either from the north directly into the marina from Belvedere Bay or from the east, on the south side of Belle Maer Marina. There is a fuel dock (diesel and gasoline) and a pumpout station. Water, power, cable TV and internet hookups are available at each slip. There are restrooms, showers and laundry facilities available. Amenities are extensive. There is a heated swimming pool plus a separate heated pool for children and also a heated whirlpool. There is a childrens' playground as well as a fitness center. A dockbox and picnic table is provided to each slip. There is a pookside cafe, ship's store and a well-regarded restaurant on-site as well. A shuttle service connects to nearby restaurants. Sommers Marine, located at Belle Maer, can carry out a wide range of engine, mechanical. electrical and prop repairs. Bay Harbor Fiberglass, located at Belle Maer, can handle all types of fiberglass and gelcoat repairs as well as painting, custom woodwork and interior repairs. Miller's Custom Boat Top Inc., located at Belle Maer, custom design, manufacture and install canvas and enclosures. They can carry out repair work as well. There are no grocery stores in the immediate area of the mouth of the Clinton River. You would have to drive to Mt. Clemens (7 mi/11 km) to find supermarkets. The nearest two would be Kroger or Value Center Marketplace. Both are located on the south side of town. Huntington Bank is the closest bank with counter service and ATM access. It is located about 3 mi/5 km from the river mouth. St John's Providence Health System (586) 226-6060 is a major hospital located 10 mi/16 km from the river mouth. Sav On Phil's 586-468-0597 is the closest pharmacy to the river mouth, about 5 mi/8 km west. In the Clinton River channel, check out Crews Inn. A popular, casual dining place, it is right on the river and has docking for 8 vessels. Eat in or sit out on the deck and watch the boats passing by. Further up the river is the River Rat Restaurant serving seafood and Italian food. At MacRay Harbor Marina, is the Harbor Grill Restaurant, a more upscale dining room with a very good reputation and great views. In Mt. Clemens, there are a variety of options including Bath City Bistro, Captain's Landing and the Engine House. Boat Town USA is all about boating and boating recreation. The fishing is very good in this area. There are a number of charter operations available that can take you out to good spots. They can be found in and around the mouth of the river. South of the river mouth is Lake St. Clair Metropark, a 770 acre/257 ha lakefront park. Over 1 mi/1.6 km of beaches and a 1,600 ft/488 m boardwalk offer great overviews of the lake. The Mt. Clemens MI tourism page on the Michigan state website will give you lots of ideas on how you can enjoy your visit to the Clinton River. It really is Boat Town USA.